Educating – Sharing - Preserving"
2170 County Road D. East, Maplewood, Minnesota 55109. The Maplewood Area Historical Society was incorporated as a non-profit 501(c)3 in 1997 to preserve and interpret the history of Maplewood through collections, events, exhibits and programs. Most of our events, exhibits and meetings are at the Bruentrup Heritage Farm but we also sponsor tours, talks and other programs offsite. 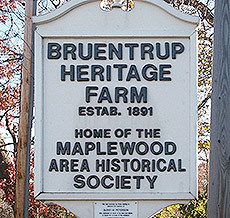 The Bruentrup Heritage Farm is located on 2 ½ acres of land with nine buildings that date back to 1891. It is surrounded on two sides by a 22 acre prairie maintained as Open Space by the City of Maplewood. The Farm is used for public events and exhibits and can be rented for private events such as weddings.